Dr. Jacobs has extensive experience in the pre-operative evaluation and post-operative care of LASIK and other vision correction procedures. If after the pre-operative evaluation, the decision is made to proceed with surgery, your information will be forwarded to the surgeon, a pre surgery consult with a surgeon will be scheduled. Post-operative management will be provided by Dr. Jacobs and will include all visits for one year. Evaluation of any additional needs such as reading glasses, sunglasses, or enhancement laser procedures is also included. LASIK is the most commonly performed refractive surgery procedure. 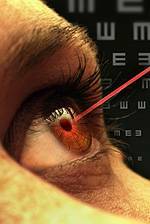 LASIK is short for "laser-assisted in situ keratomileusis."